Shopping for Flash Gordon Action Figures? “There is something more powerful in this galaxy than Ming's law!" Exclusive first-ever 3 3/4-inch scale action figure from the 1980 Flash Gordon film! Flash Gordon's Prince Barin features multiple points of articulation and includes a sword accessory. Limited edition of only 1,448 individually numbered pieces! Entertainment Earth Exclusive! If you’re going to save the universe, you’ll need a best friend to help. That’s why Bif Bang Pow! is presenting the first-ever 3 3/4-inch scale action figure of Flash Gordon’s intergalactic bestie, Prince Barin, from the 1980 Flash Gordon sci-fi movie. 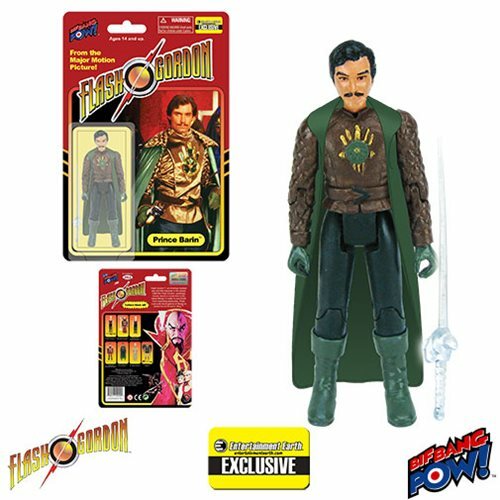 This meticulously detailed Flash Gordon Prince Barin in Cape 3 3/4-Inch Action Figure - Entertainment Earth Exclusive showcases Prince Barin in his movie-inspired outfit, complete with a green fabric cape. The figure has 9 points of articulation and includes the prince’s trusty sword accessory. As a limited edition collectible, this won’t be around to save your collection for long, so order now! Ages 14 and up. Flash Gordon™ is an American football star and title character in the classic 1980 film Flash Gordon who unwillingly travels aboard a rocket ship to the planet Mongo. To save Earth from impending destruction, Flash must unite the kingdoms of Mongo to defeat the evil Emperor Ming™.